With Portland, Oregon, as their epicenter, America’s genius brewers are opening new tasting rooms, taprooms and massive beer gardens. Here, exciting updates in the craft-beer movement. Christian DeBenedetti has immersed himself in all things beer for the past 15 years: traveling to visit breweries around the world, writing books, blogging and home brewing. So when he finally decided to embark on opening his own brewery, he knew exactly what he wanted. In the course of a year, he transformed the beautiful 1912 barn on his parents’ hazelnut farm in the Willamette Valley into Wolves & People Farmhouse Brewery. 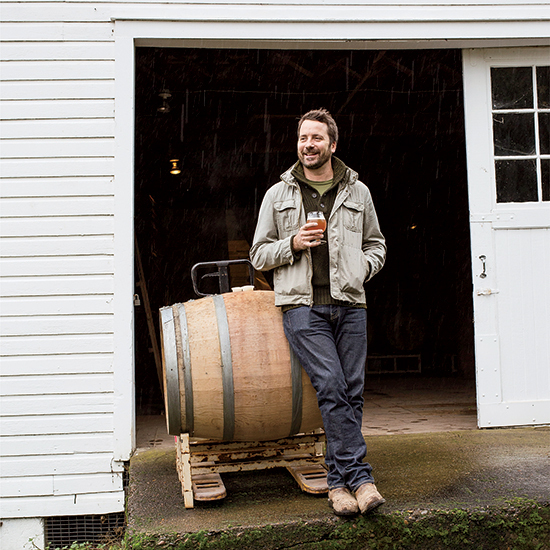 He filled it with barrels from local wineries and whiskey makers, which allow him to create the kinds of beers he loves best: wood-aged, sour and fruited ones. Working with Jordan Keeper, former head brewer at the spectacular Jester King in Austin, DeBenedetti’s first release is Sebastian, a saison. He made it with yeast he propagated from a plum tree next to the brewery. “I’m hoping I can create a form of terroir for beer by using yeast from our fruit trees, water from our spring and even some hazelnuts from the property,” he says. For now, the tasting room is in the middle of the brewery, among the barrels. Visitors can also sit at picnic tables outside near the orchard trees, and there are plans for a new space that will be very similar to a winery tasting room. Tireless in his devotion to beer, DeBenedetti also has a new book, Beer Bites, out next month. 30203 NE Benjamin Rd., Newberg; wolvesandpeople.com. The huge boom in American craft breweries (there are more than 3,600, with 1,700 more in the works) has led to enormous competition for hops—the flowers from the Humulus lupulus vine that give beer its bitterness. Brewers have been forced to buy hops futures, placing orders up to five years in advance for the most popular types. Some ambitious brewers, like Ken Grossman of California’s Sierra Nevada, have been planting their own hops fields—not to avoid the shortage but to have more creative freedom. Meanwhile American scientists are working to breed new varieties. Some of the most popular come from the Hop Breeding Company, based in Washington state, which has invented Equinox, Citra and Mosaic. For the past 50 years or so, most American brewers have imported malts—germinated, dried and sometimes roasted grains—from Europe. But recently there’s been a revival of the American maltster, working with regionally specific barleys, wheats, ryes and even millet. For now, the movement is just starting, with the most committed breweries, like Dogfish Head and North Carolina’s Wicked Weed Brewing, buying small-production American malts only for special brews. But more brewers are getting in the game: Dave McLean, owner of Magnolia Pub & Brewery in San Francisco, is launching what he believes will be the largest craft-malting company in the US. Hotel Vermont beer concierge Matt Canning has a superpower: He can get his hands on any of the culty, small-batch Vermont beers his guests are hunting for. That’s why the new Burlington hotel, with its woodsy-chic rooms and Lake Champlain views, has become the place to stay for beer fanatics. Its restaurant, Juniper, has 10 Vermont beers on draft at all times, but the real draw is Canning, who leads craft-beer tours to breweries across the city—by bike. He also hosts biweekly road trips to farther-flung stops, like Hill Farmstead Brewery and Lost Nation Brewing, a few hours away. Plus, he can steer guests to the restaurants in town with the best beer lists, and has insider intel on who’s getting deliveries of The Alchemist’s Heady Topper on which days. Doubles from $229; 41 Cherry St., Burlington, Vermont; hotelvt.com.